(Al Hartmann | The Salt Lake Tribune) Connie Olsen bags up a fresh loaf of bread from the bakery for a customer at the new Harmons grocery store that opened in Holladay Wednesday, Feb. 21, 2018. The new store is 16,500 square feet on three stories and smaller than typical Harmons stores. 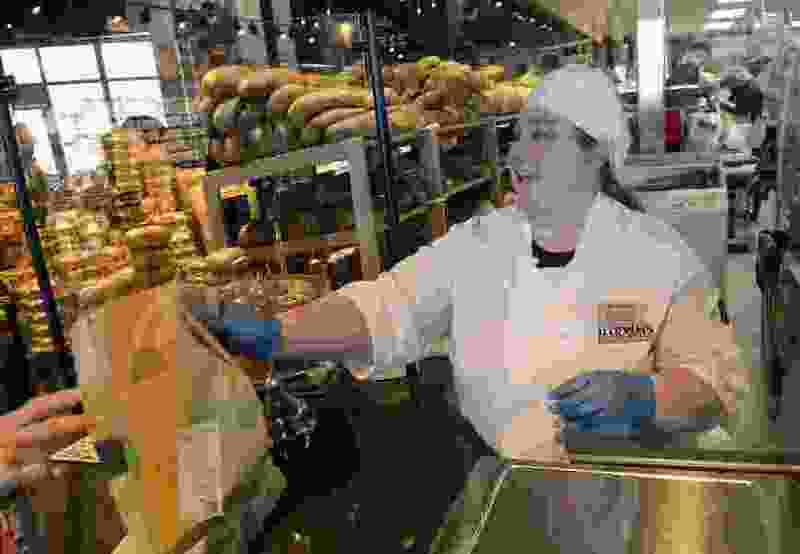 Customers can still get full-service offerings including prepared foods, artisan bread, gourmet cheese, dry-aged beef, a cooking school and fresh flowers. After voting it down earlier in the day, the Senate resurrected and approved a bill Wednesday to ban cities and counties from imposing fees on shopping bags, bottles, cans, cups or other containers — or even regulating them by, for example, banning plastic bags, as Park City has done. The Senate passed SB218 on a 16-12 vote, and sent it to the the House. Senators had voted it down earlier in the day. Also, the bill also came after a Senate committee earlier killed SB192, which sought to impose a statewide 10-cent fee on grocery bags to cut down on landfill trash, and referred it for more study. Sen. Gregg Buxton, R-Roy, sponsor of SB218, said it would require that any regulation or tax on bags, cups, containers and similar items be made only at the state level to prevent a patchwork of different rules in cities and counties. He said differing laws in California, for example, resulted in headlines of waiters in some cities being jailed for offering a plastic straw or a Styrofoam carry-out container. The Utah Restaurant Association backed the bill. Local fees could hamper the ability of restaurants and stores to buy bags and other containers in bulk statewide, the group’s president and CEO, Melva Sine, testified in committee. The Utah League of Cities and Towns opposed the measure, saying it limits local ability to address local problems. For example, Cameron Diehl, executive director, said, it would erase action by Park City to ban plastic bags at its three large grocery stores — a prohibition adopted to help control trash and landfill problems there. Grocery stores often ask patrons if they want paper or plastic. Lawmakers asked a different question Friday: Should the state impose a new 10-cent bag fee to cut down on landfill trash or should the state ban local governments from charging such fees? The Senate Economic Development Committee picked the latter Friday, advancing a ban on local bag fees — and decided that the idea for a state tax needs more study. 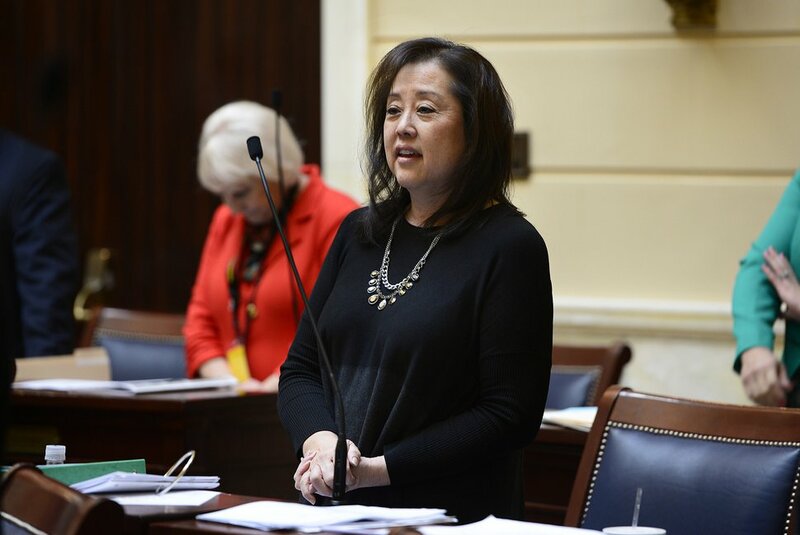 It voted 4-0 to recommend more study later this year for SB192 by Sen. Jani Iwamoto, D-Holladay, that would have imposed that 10-cent-a-bag fee. And it voted 3-0 to advance SB218 by Sen. Gregg Buxton, R-Roy, to prevent cities and counties from imposing such fees on bags, bottles, cans, cups or other containers — or even regulating them by, for example, banning plastic bags, as Park City has done. Iwamoto argued that a 10-cent statewide fee on grocery bags — paper or plastic — would provide the incentive needed to cut down on trash they cause, and encourage use of reusable bags. She said similar fees in other countries have reduced trash from plastic bags by 80 percent to 90 percent. Scott Sommerdorf | The Salt Lake Tribune Senator Jani Iwamoto, D-Salt Lake, Thursday, January 29, 2015. Mark Hoyer, manager of the Trans-Jordan Landfill in Salt Lake County, said plastic bags cannot be easily recycled, and become airborne and disintegrate into small pieces creating trash problems. Landfills statewide are planning more than $1 million in new fences, nets and other facilities because of problems from the bags, he said. Trash bags account for only 0.4 percent of total refuse by weight, Hoyer added, but 85 percent to 95 percent of the trash problem. Millcreek Mayor Jeff Silvestrini said he sees a proposed 10-cent-per-bag fee as a “potential tax savings” for residents because of lower landfill and trash cleaning fees that are now funded through local taxes. Larry Gibbons, vice president of Rocky Mountain Recycling, said plastic bags also jam recycling equipment, raising recycling fees that cities pay. George Chapman, a former Salt Lake City mayoral candidate, opposed the bill — calling it an additional tax on food that would especially hurt low-income people. The bill would have several exemptions from the fee for such things as newspaper bags and bags for produce and bulk food items. Iwamoto’s bill proposed to give half the money raised — estimated by legislative analysts at $16.9 million a year — to grocery stores to collect the fee, bundle single-use bags for special recycling and for reusable bag programs. The other half would go to landfills and similar facilities to handle trash problems. The committee referred the plan for more study later this year, saying it has many unresolved questions about whether it would guarantee funds raised would be used as promised — and whether it could result in lower landfill fees to offset the bag fee. Meanwhile, Buxton said his loosely related bill would require that any regulation or tax on bags, cups, containers, straws and similar items be made only at the state level to prevent a patchwork of different rules in cities and counties. Francisco Kjolseth | The Salt Lake Tribune Sen. Gregg Buxton, R-Roy, jokes that his phone has been giving him a massage all day as wisecracking discussion ensues on SB172 by Sen. Todd Weiler, R-Woods Cross, that pushes to allow barbers to legally perform brief neck massages on customers. Melva Sine, president and CEO of the Utah Restaurant Association, backed the bill. Restaurants and stores often buy such items in bulk for use around the state, she said, but could lose that ability if some cities ban items and others do not. Cameron Diehl, executive director of the Utah League of Cities and Towns, opposed the measure, saying it limits local ability to address local problems. For example, he said, it would erase action by Park City to ban plastic bags at its three large grocery stores — a prohibition adopted to help control trash and landfill problems there. 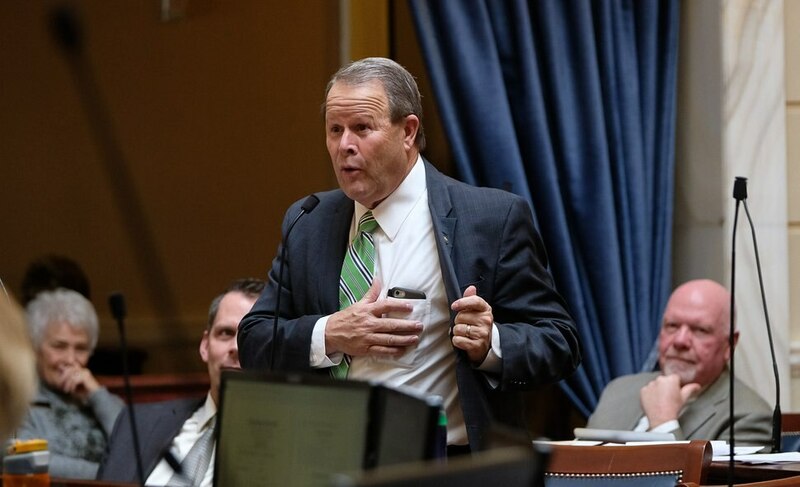 While SB218 advanced, Committee Chairman Jake Anderegg, R-Lehi, warned Buxton that he faces a huge hurdle to advance the bill through both chambers in nine working days remaining in the session.